If you need roofing in Laguna Vista, TX for an affordable price, do you know who to contact? For dependable roofing, you can count on ECO Commercial Roofing at (833) 200-0571 to save the day! We’re experts in a wide selection of roof services, and we take customer satisfaction very seriously. We’re active members of our communities, and we’ve been reliable Laguna Vista roofers for a long time now. Our experienced roofers can offer a handful of solutions for your roof requirements, as well as answer any inquiries you might have. Whenever you’re looking for a smarter roof experience, call the professionals at ECO Commercial Roofing for help. Your roofing plays a significant role in protecting your property, so it’s of the greatest importance that you employ a contractor you can rely on. To provide clients with that peace of mind, we use high quality products from Conklin, and we train all of our roofers to the industry standards. We know that the roofing you choose can alter the price of your property as well, so we offer many different roof materials for you to choose from. When picking, remember that while the look plays a big role, that the long term benefits also need careful consideration. Your budget will also be a deciding factor, in addition to the type of building the roof will be applied to. Luckily, our team can provide you with plenty of options. We’re glad to assist you with any and all of your roof needs, from replacements to installations, and anything in between. No matter which type of roofing service you need, from commercial, to residential, or even industrial, we have the services you need. Our commercial roof services are meant to cater to business owners who possess low-sloped or flat roofing systems. Flat roofs can be a bit tricky, and without professional installation, you might be stuck with leaks or ponding. Industrial roofs, though similar to commercial roofs, typically require stronger materials, as well as extremely skilled installation to guarantee longevity. For homeowners, we also have a variety of cost-effective residential roofing styles that are sure to accommodate your needs! As roofers that specialize in roofing restoration, we understand more than a few techniques to work with roof coatings. We have decades of experience with roof coatings, and we know that utilizing top quality products such as Conklin can make all the difference when a project is completed. In order to deliver superior roofing in Laguna Vista, TX, our crew works hard to provide unbeatable client satisfaction, with the assistance of detailed craftsmanship and experience. Contact our professionals at (833) 200-0571 if you’d like to discover more about our roof restorations, and the benefits of Conklin roof coatings! When your roof is approaching the end of its life, you can often decide to replace it or to restore it, and we often advise restoration. We utilize Conklin roof coatings in the majority of our restoration processes, and with these coatings you can usually gain another ten years for the longevity of your roof system. Choosing a roof restoration from a reliable roofer will conserve your time and money when compared to a total roof replacement. Our primary method of roof restoration depends on top quality Conklin roof coatings. Available in a selection of types and purposes, you can depend on our roofers to help you determine which option will work best for you. Various coatings provide different levels of adhesion, flexibility, and water resistance. 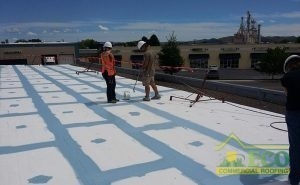 Typically, we can also install the roof coating without removing your previous roof material. To discover more, call our team today at (833) 200-0571! Among the many types of commercial roofs we can provide, are low slope roofs as well as flat roofs. Bear in mind that your first line of defense against punctures or premature roof failure is a dependable and expert installation. 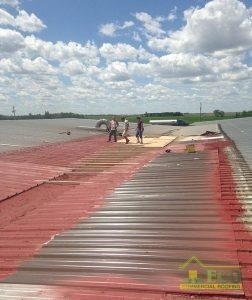 If you want your building’s roofing solution to work efficiently, and endure for a long time, our contractors are here to help. Residential and commercial roof services from ECO Commercial Roofing are reliable and cost-effective. You can find our durable roofing in Laguna Vista, TX, as well as the surrounding areas. Any building can benefit from the application of a high quality roofing investment. To find out how we can best serve you, give us a call at (833) 200-0571, and we’ll schedule an appointment as quickly as possible.